The Netflix series "Tidying Up with Marie Kondo" is inspiring LIers to clean their homes and could be the reason behind an uptick in donations at local thrift stores. It sparks joy for Patty Morrissey to help others spark joy. 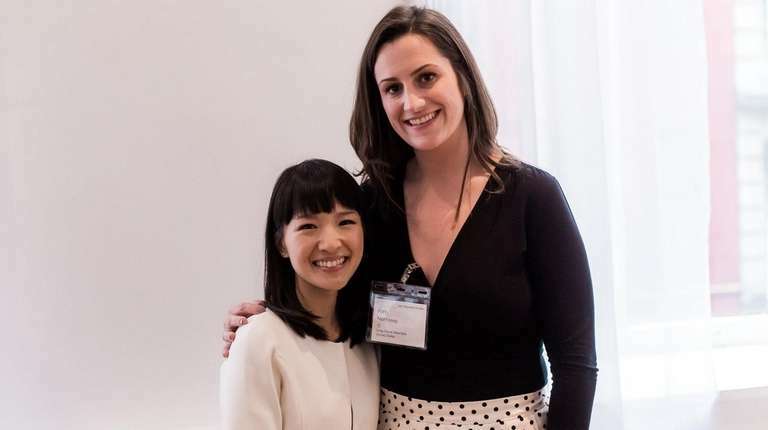 The Long Island native traded in her career as a social worker to pursue one with Japanese tidying guru Marie Kondo, whose organization method focuses on only keeping items that spark joy and discarding the ones that don't. Morrissey, now a full-time KonMari consultant, first met Kondo in 2016 at the Japan Society in Manhattan. Morrissey was part of the first training seminar outside of Japan for people interested in becoming certified KonMari consultants. Kondo skyrocketed to fame in the United States after the 2014 release of her best-selling book, “The Life-Changing Magic of Tidying Up." On New Year's Day, Netflix released a new series “Tidying Up with Marie Kondo,” which is inspiring many Americans to purge their belongings and organize their homes. Kondo’s organizing method, KonMari, encourages people to tackle their belongings by category instead of by room, keeping only those that “spark joy” and thanking the items they’re getting rid of for their service. Morrissey teaches seminars with Kondo in New York City and London and also leads sessions on her own, including upcoming free ones at libraries across Long Island. “Marie did not seek to become famous. Her happy place is writing books, spending time with her daughters, and growing her media company," said Morrissey. "She's been so generous and trusting of other people to do work on her behalf, training consultants and sharing speaking opportunities. I've had the opportunity to take on a lot of this responsibility." Morrissey used to host parties to create vision boards, a collage made with words and images to motivate one's aspirations. She said she's always been interested in helping people organize their goals and was inspired by Kondo's book. She’s now a gold-level KonMari consultant, putting her near the top of the company's 216 certified consultants worldwide. She said she’ll soon be moving up to the next level, Platinum, which requires at least 300 tidying sessions with 30 clients and has been attained by six people; and then finally after that Master, requiring 500 tidying sessions with 50 clients, which has two people. Since the show’s release, “my phone has been ringing nonstop,” said Morrissey, who has clients on Long Island and in New York City. In the show, Kondo greets each new client’s home by kneeling on the ground and silently expressing gratitude for the house for keeping them safe and giving them shelter. “As a consultant, I would do a subtle greeting in my own head. The client never knew it,” said Morrissey. But after seeing the positive reactions in the show, “now I straight up get on the floor,” she said. She said the show is a mostly accurate portrayal of what actually goes on in the field — except for the scenes of family members working together to tackle the mountain of things. Morrissey likens hiring a professional organizer to working with a personal trainer. Morrissey works with a team of organizers, including a bronze-level KonMari consultant based in Oceanside whom she apprenticed. “A trained consultant will be able to read body language and be able to intervene," Morrisey said. Morrissey offers different types of tidying sessions, ranging from $150 per hour to $7,500 for a five-day intensive session geared toward people who are moving or have just moved. "The lifetime benefits are unmatched. It changes how [people] use their space. It has deeper psychological, spiritual benefits," she said. But how do you know if something sparks joy? There should be a physical response when you touch an item, Kondo explains. “It feels as if every cell or every part of your body lifts up, little by little. This is a sensation your body would feel if you touch an item that sparks joy,” Kondo says in a video posted on YouTube with an English translation. “[Kondo's] mission to organize the world and get as many people to confront their stuff so they can live their best life is really what it’s about for her," Morrissey said. A 'KONDO-EFFECT' AT THRIFT STORES? Some thrift stores on Long Island say they've seen an increase in donations lately, although it's unclear if the show's popularity is the reason. This is the most full she’s seen the store since its opening in October 2017, she said. “There’s not an empty shelf,” said Loesch, who had never heard of the show until Newsday reached out. Among the donations she’s seeing: lots of clothes, designer bags, fine china, collectibles, furniture, lighting, TVs and paintings. “The downside is: When you’re not expecting it, you don’t have enough people to sort it. There are days when you have to put it to the side, it’s hard to navigate,” Loesch said. 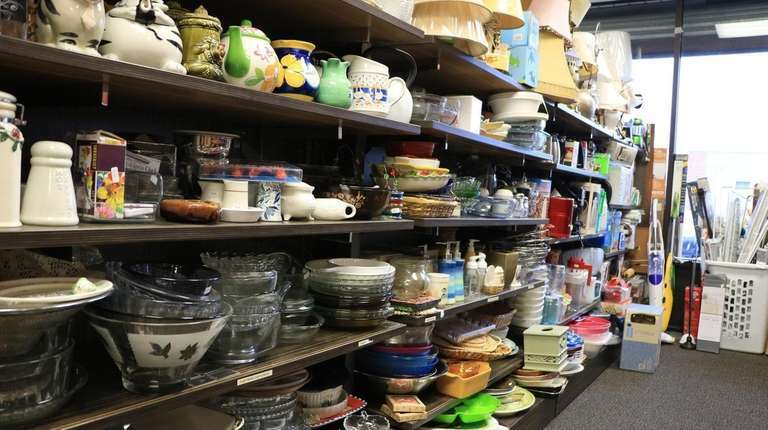 At Salvation Army thrift stores, a spokeswoman said they do tend to see an increase in donations around this time of year and Kondo's show on Netflix "is likely influencing some people to give even more," said spokeswoman Trish Raines. Savers, which has thrift stores in West Hempstead, Commack, Holbrook and Medford, also noticed a rise in both donations and foot traffic since the start of the year, said spokeswoman Sara Gaugl. Goodwill stores in East Northport and Lake Ronkonkoma reported an increase in donations since the beginning of January, which is traditionally a slow month — but it’s hard to attribute that only to the “Kondo-effect,” said Jose Medellin, director of communications for Goodwill NYNJ. People could also be donating items this time of year for a variety of reasons, he said. They could be decluttering because they got new items for Christmas or had time around the holidays for home improvement projects. Or for some it could be their New Year’s resolution, or to get a receipt for tax season. Courtney Thaler, 39, first heard of Marie Kondo a few years ago when she saw her book at a store in an airport. She bought it, read it, was intrigued by it, but never did start the process on her own. "I didn’t think that I could successfully tackle clothing," she said, which is the category that Kondo says to organize first. She dreaded facing her closet and just never found the time to do it. She hired Morrissey to assist her with the daunting task, and they had a five-hour session last week in her Huntington home. "I'm not stressed out anymore. 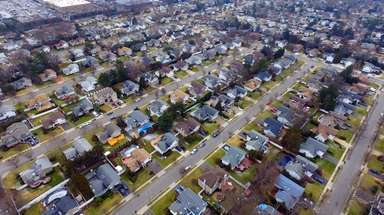 It's an immediate return on your time, mood and your house," she said. After the session, Thaler filled seven lawn bags of clothes and three bags of socks. She donated those to thrift stores and nearby clothing drop-off boxes and gave some to her sister. "When you own things that you don’t want to own, they start to own you," she said. Thaler said she feels confident about tackling the next steps in the KonMari method herself that she probably doesn't need Morrissey's help going forward. "But it's nice to know she's there if I get stuck," Thaler said. Thaler first hired Morrissey last summer to help her and her co-workers at the Love of Learning Montessori School to clean out and organize the belongings of a director at the school who recently died. That whole process took about three months long. "There's no way anyone can do this and regret it. It was such a positive experience," she said. Tara Otero of East Meadow said she binged-watched all eight episodes in two days and decided to tackle the KonMari method on her own. Otero, 39, filled eight full trash bags up with clothes from just her bedroom. Those clothes have now sparked joy for the East Meadow Jewish Center, where she donated them. She’s trying to sell some household items through Facebook groups and whatever she doesn’t sell, she plans to donate. 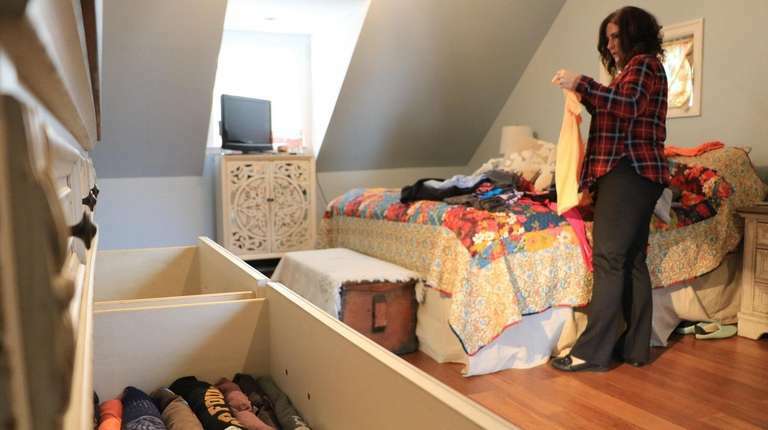 Another Long Islander who has attempted the KonMari process alone is 48-year-old Heather Fiore. She still has two episodes left but says that she was inspired right away to start decluttering her North Bellmore home. She now folds her clothes the “KonMari” way, which shapes the clothes so they stand upright. She reorganized her pantry, her spices and her makeup drawer. “When the food is organized, we can actually see what we have and what we don’t have,” said Fiore, a mother of three teenage sons. She’s offering other things, like books and games still in good condition, to her Facebook friends for free. She said sometimes her friends want to pay her for the items but she refuses. Morrissey said her clients range from all ages from families, to singles looking to incorporate the practice and to seniors looking to downsize. "When you only have the things that you love, you don't have to worry about organization," said Morrissey. "It kind of happens." Kimberly Yuen is a Newsday.com internet news manager who helps run the homepage and app fronts. A Hawaii native, she is on the hunt for the best poke bowl on Long Island. See what's new on Netflix this monthCan't decide what to watch on Netflix? Here's a sampling of the site's latest offerings.